Once again Deanne has used her favorite technique of paper piecing. She's so talented!!! Once again she has added those special touches such as stitching and a die cut edge. Deanne used "Chance of Showers" which can be found HERE (non-EU Residents) and HERE (EU Residents ONLY). Of course here at Deedee's Digis we are THRILLED she's using digis! :) Be sure to stop by Deanne's blog - A Little Bit O' Paper - and leave her some love. Also browse around a bit - you'll see some lovely work! Come back next week and see what Deanne has planned for us...it's going to be simply YUMMY! 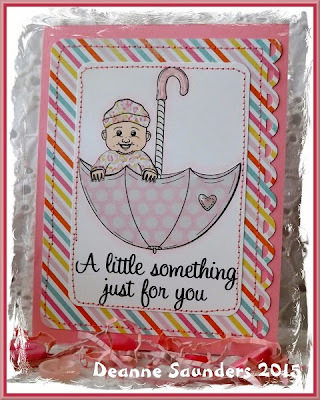 Deanne did a fabulous job whipping up this darling card. This image is a favorite of mine but I also like how she added the sweet paper and her stitching. 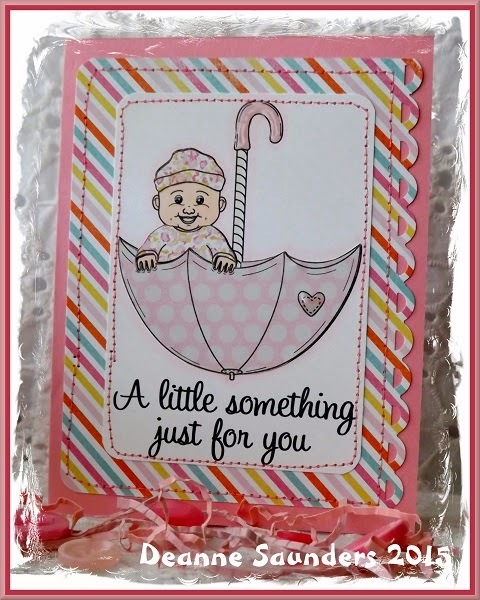 Fun, sweet card.